The opening line drew me in, and the first short chapter captured me entirely. The streets were lit but the sky was still light. She was waiting at a bus stop. A sign said BALSAMIC although there was nothing vinegary about the place, no friars and no Gilead in sight. There were nondescript buildings in warm colours, perhaps leaning a bit, perhaps painted on canvas. She was waiting for the bus; there were obscure figures queuing behind her. 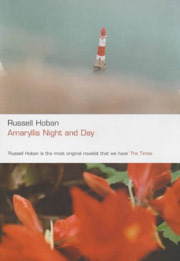 That’s the second paragraph of Amaryllis Night and Day, and it brings together several of Hoban’s recurring concerns: blurred borders between what’s real and not-real, painting, London, and a playful exploration of language. I’ve since read my way through most of Hoban’s novels at least once, often several times. He’s best known for Riddley Walker, which is certainly his most influential novel (David Mitchell and Will Self have both talked about how they drew on its extraordinary, broken language in their own experiments with future versions of English, in Cloud Atlas and The Book of Dave respectively). Riddley Walker is an astonishing, dense, infinitely re-readable book – but the far simpler Amaryllis Night and Day remains closest to my heart. This year I’ve planned badly – no yellow A4 paper! – but I’ll still be leaving quotations in appropriate places.. And if you don’t stumble across any yellow pages, you can follow SA4QE on Twitter and Facebook as well as russellhoban.org. 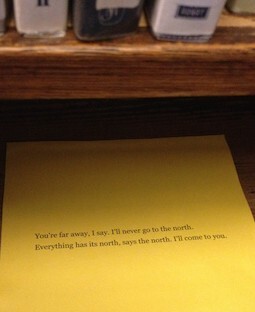 Some times theres mor in the emty paper nor there is when you get the writing down on it. You try to word the big things and they tern ther backs on you.